July 14, 1990, L. G. Crabo. Euxoa aberrans is a uniform powdery brown small to medium-sized Euxoa (FW length 14–18 mm) with a dusting of light gray scales, relatively inconspicuous lines, and pale-rimmed orbicular and reniform spots that flies in dry forests during late summer. The forewing is warm wood brown with a powdery appearance due to a suffusion of light gray scales, slightly hoary gray along the costa. The wing distal wing is often darker gray, including the terminal area and subterminal shade. The lines are gray or black, double filled with the ground color or tan, variable in darkness from absent except as spots on the costa to strong across the wing. The antemedial line is irregular, toothed basad on the vines, angled slightly toward the outer margin. The median line is dark gray, diffuse, faint or absent. The postmedial line is usually single, thin, sharply and evenly toothed on the veins, drawn basad on the costa, bluntly curved around the reniform spots and sometimes weakly concave opposite the mid-cell, and nearly straight or slightly concave at a 45° angle toward the base below the level of the cell. The subterminal line is luteous, thin or broken into small spots, offset slightly below the apex and slightly irregular across the rest of the wing. It is preceded by a gray shade, darkest on the costa and interrupted at the level of the anterior cell. The terminal line is dark, thin or broken into spots. The orbicular and reniform spots are outlined in black with whitish gray to light orange lining and filling of the ground color. The orbicular spot is round or a small upright oval, small to moderate-sized. The reniform spot is kidney-shaped. The claviform spot is gray to black, usually small and inconspicuous. The hindwing is tan-gray with darker gray margin, veins, discal spot, and terminal line. Its fringe is white with a gray base. The head and thorax are powdery brown to red-brown. A frontal tubercle is present. The male antenna is biserrate. 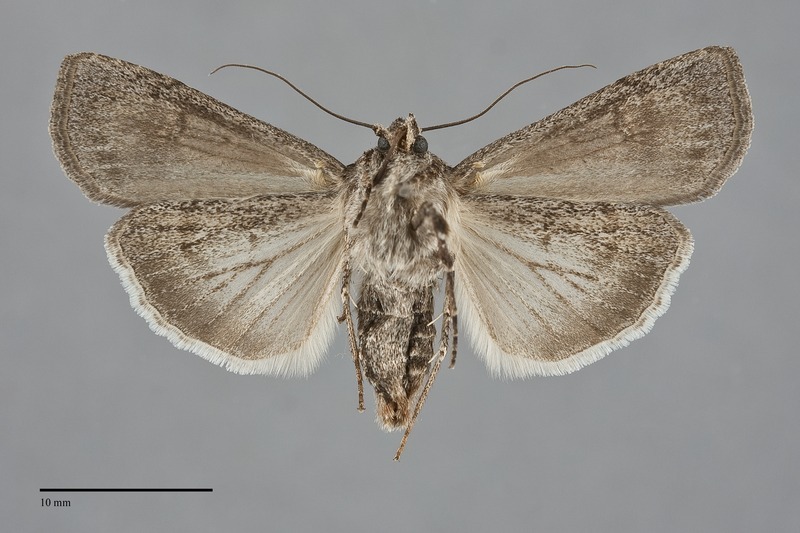 This species is placed in the subgenus Orosagrotis. 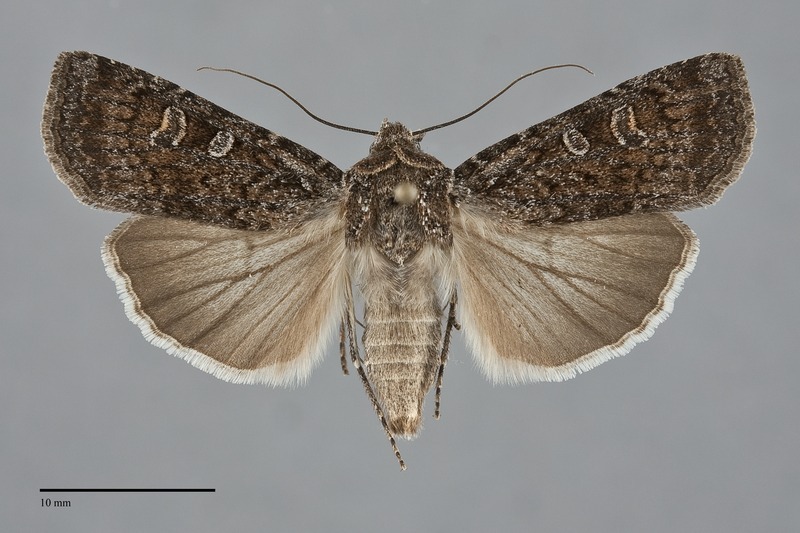 This species is superficially similar to many other brown Euxoa species, but can usually be recognized by the combination of nearly even hoary wing color and light-rimmed spots. It is probably most similar to Euxoa simona and Euxoa pleuritica but is more uniform in color than both of these species. It is also smaller than E. simona. It can also be confused with brown specimens of the variable common species Euxoa tessellata. It is usually lighter, grayer, and more mottled, and forms that are dark and more uniform of it are less powdery than E. aberrans. The pale lining of its spots is less uniform around the entire perimeter. Euxoa tessellata males usually have a tuft of yellow scales at the base of the forewing and females have apically truncate ovipositor lobes, both absent in E. aberrans. Euxoa aberrans lacks the pale streak in the fold of many of the other species in the subgenus Orosagrotis. This is a relatively uncommon species that is found in coniferous forests in the Pacific Northwest. It is most frequent in ponderosa pine forests and juniper woodlands east of the Cascades, but also occurs in spruce-fir forests at higher elevations to timberline. It is frequently collected on open ridges at middle to high elevations. Euxoa aberrans is widely distributed in dry forests east of the Coast Range and Cascade crests in the Pacific Northwest as far north as south-central British Columbia and as far east as western Montana. Most records are from the east slope of the Cascade Mountains in Washington in our region, but this might be due to more frequent collecting in appropriate habitat in this area compared to other regions. This moth has not been found in Idaho but is likely to occur there. Euxoa aberrans has a fairly small distribution relative to other Euxoa species, which is also disjunct (Lafontaine 1987). It occurs in the Pacific Northwest and across southern Alberta to western Saskatchewan in the West, and in southern Manitoba and northern Michigan east of the Great Plains. No information is presently available regarding larval foodplants of this species, but it is probably a soil-surface feeding cutworm that feeds on general herbaceous vegetation based upon related species. Adults fly mostly during the summer, but the flight season extends to early fall. Specimens from the Pacific Northwest have been collected as early as late June and as late as mid-September. Most records are from late July and early August. This species is nocturnal and comes to lights.